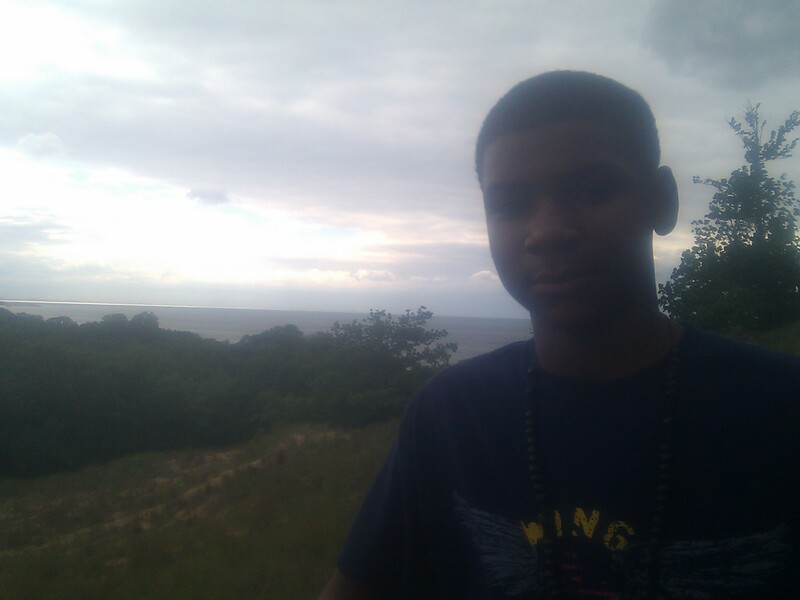 Cornelius Jordan poses at the Indiana Dunes. Photo by Quintana Woodridge. Birds, water, grass, rocks, squirrels, raccoons…it looks like a forest, but it is the Indiana Dunes State Park. There is a campground and lots of trees. And a parking lot under construction. That’s because the parking lot is being partly removed to return the space to its natural state. Standing near the parking lot and a creek that runs into Lake Michigan, Indiana Dunes State Park property manager Brandt Baughman said that in 2005 the flooded creek waters were as high as the people standing there. That was partly because where the creek is now used to be a huge parking lot. As a way of restoring the natural surroundings, they took out the parking lot and restored the creek to its natural path. Before the creek had run under the parking lot. Now fewer people can park in the dunes but Baughman said it is worth it. He said it cost $7,000 to remove the parking lot, but “it turned out to be a good project.”The creek restoration actually started in 2008 after a flood that made the parking lot into a big pond and washed parts of it away. Instead of repairing it, they decided to remove it and bring back the creek. “It is much better scenery now,” said Baughman, even though the project is still under construction. The construction was delayed this summer because of weather, but Baughman said at the time they were about 30 days from finishing it, including a new bridge and picnic tables near the creek, with a trail that will be wheelchair accessible. Baughman said trout and other types of fish live in the creek, swimming back and forth from Lake Michigan. “Before you wouldn’t see fish because they would have to swim through concrete” under the parking lot, Baughman said. He said you also see lots of deer – so many that they have to manage the population. He said they tell people not to feed deer or other animals so that they don’t get out of control. People can camp at the dunes for up to 14 days. “They can’t camp here for the whole summer. We want different people to cycle in and out,” Baughman said. Asked whether anyone has been hurt on the creek construction project, Baughman said no. “And we would know it” he said because of a live webcam watching the site. The webcam is there because the project got federal stimulus dollars. There are fences around the construction area so people don’t trespass on it. Baughman pointed out the native dunes grass and other native plants planted along the creek. He also said the recent storms this summer did not affect the lake or the dunes. Baughman said he became a ranger kind of “by accident” as he was working in a park as a lifeguard. When he went golfing he met the man who would become his boss at the state park, who suggested he apply for the job. The Indiana Dunes is an important space for animals to live, and also for people to have activities and to go to the beach. Restoring the creek will make it even better. This entry was posted	on Friday, July 29th, 2011 at 11:31 pm. You can follow any responses to this entry through the RSS 2.0 feed. You can leave a response, or trackback from your own site.